I am renovating a small kitchen in a seaside town and this is perfect. 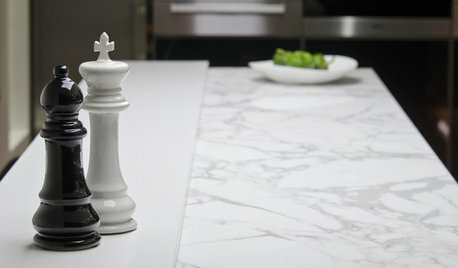 The counter is an engineered quartz by Pental Quartz. Absolutely a fantastic color, not to dark, not too grey, but just that perfect shade that works well with the white and off whites. 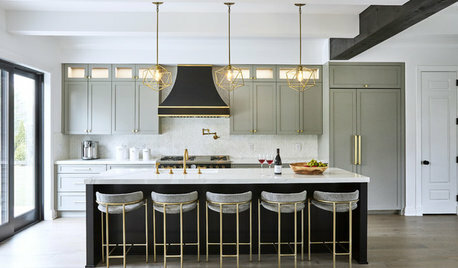 The veining/movement has more a cream base, so it softens the room and doesn't feel too stark with all the other whites we used in the kitchen. Your kitchen is beautiful, I can already tell :) And I LOVE your full-size fridge/freezer! First off, do NOT feel bad about the formica. 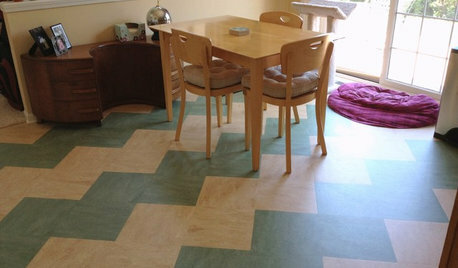 There are a few ways to make formica look current, and it is crazy-functional. 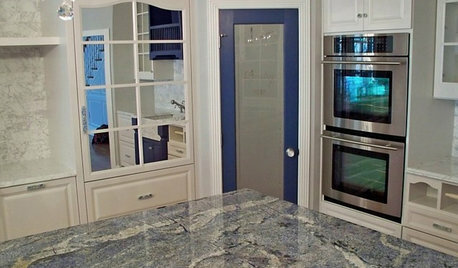 My 20 X 20 home kitchen has granite countertops, 9 ft island and all, have had them for the last 8 years. My newly built "beach" cottage kitchen 14 X 14, smaller island, has formica...and to my surprise I LOVE it! I love it's function, I love that it's warmer-feeling than stone, I love the price, I love its simplicity, and I even love the look. 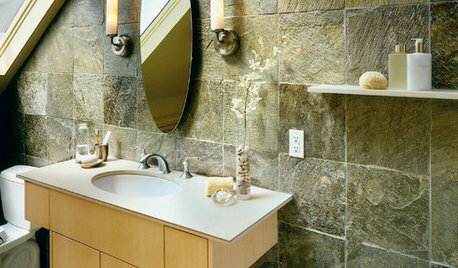 I chose a surface by Formica called Oiled Soapstone that I had made thinner than standard formica. You can see in the attachments, it is a pretty decent fakeout for soapstone, but i also love that doesn't stand out so much...lets the overall space speak for itself. There was also a marble fakeout in their higher-end that looked pretty good, but I decided I wasn't going to try to make it look like stone, but instead just embrace that it is 'laminate' and I'm proud of it ;) I decided to use tile backsplash instead of the 4" formica backsplash [I almost embraced as well], simply because I prefer the function of it (hate when water splashes on painted walls) and I liked the look of my cheap subway tiles with gray grout so much that I wanted to highlight it. You can take a peak of my photos below As for your seams, I might run the formica all the way from the corner to the stove, with a seam 2 feet from the side wall, then 12 feet from that point (the sink will be dropped into this piece), and then a seam wher the next piece begins to get that extra 2 ft covered to the other side wall. So 2 seams, each 2 ft from the walls on each side of the sink. I think seams far away from water is best when it comes to laminate, and they will be in a less obvious location (not so front-and-center). My seam is (I think) 2 ft from my corner. It is tight, and I don't even notice it! I think keeping it away from water is key, and you may be placing dishes to dry where you have it planned now/where piece of wood is in your pic. 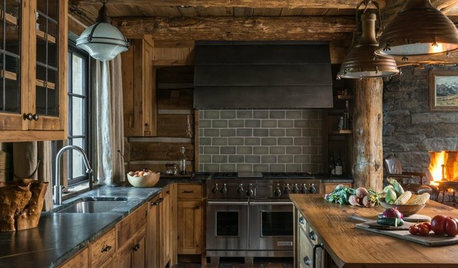 I wouldn't do butcher block or anything else to break up your perimeter countertop, especially with how funtional/low maintenance formica is and how nice/streamlined the counters will look with just one surface. And wood is not low maintenance, in my opinion.Just my two cents. 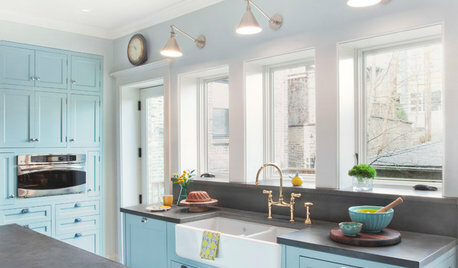 And finally, I say love your kitchen for it's own style, who cares about trends. 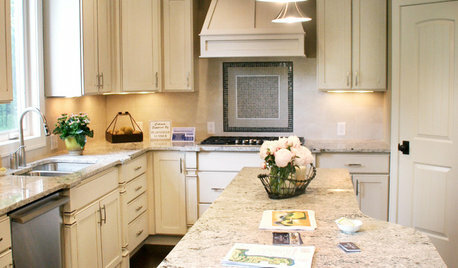 I did my traditional cream perimeter/wood island style kitchen at home 8 years ago and stiil love it. I am lucky enough that I got to do my white beach kitchen in my cottage and love that too. Really can't say though that I prefer one over the other, they both give me diferent feelings: one warm and cozy, one light an airy. I think you accomplished building a space that is warm and cozy, just as it sounds like you set out to do. Enjoy! Well, yes, there is laminate, which isn't solid all the way through the same material. 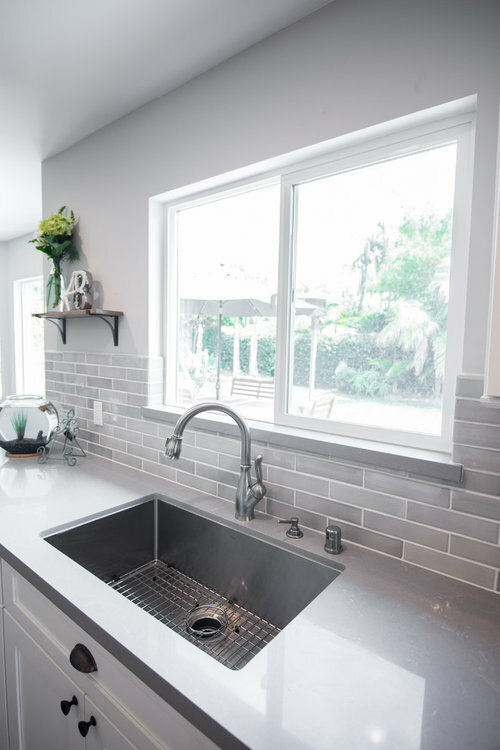 It is layers of different materials, and that's what makes it unsuitable for use with an undermount sink. The layer of particle board underneath the laminate is exposed. Back to the OP's question. :-) Plain white never clashes with plain black. Especially if you choose a more matte sheen for it than the polished granite. The contrast really works. Corianesque materials are pretty easy to live with, as any of the small scratches don't really show at all on one of the light colored surfaces. I know of a couple who just had their 30 year old Corian resurfaced right before they moved, and it looked brand new. 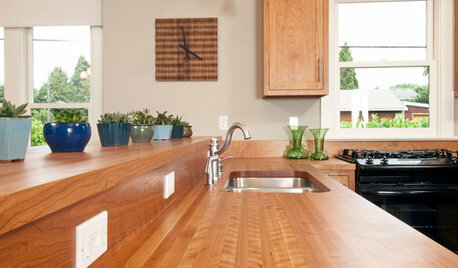 What other counter surfaces would go with a butcher block island top? Hmm--a lighter gray, or a darker gray? Great point about the matte finish, I think that will be critical with the butcher block, and I hadn't realized till you said it. Thank you! but we aren't talking about granite. (and true granite will not etch from kitchen foods,,but that's another geology lesson) we are talking about calling Super White, a Quartzite. It's Dolomite. often has quartz crystals, can sometimes act like a quartzite, but geologically it's dolomite, and should be sold as such. The fact that it bubbles w/a drop of acid is the test for calcite/dolomite composition. PRO MOSCONE MARBLE &amp; GRANITE Super White QUARTZITE is more hardier then marble but not as durable as granite in my opinion and my experience since 1991 - and yes i am definitely IN the business So stop referring to Super White as a quartzite. that's all I said wayyyyy back up in comments. pink,,yes,,I'm aware of the MOHS scale. tell your hubby thanks! (and true granite isn't even some of the stuff they sell as granite!) Granite is actually at a 6-6.5,,but yes, quartzite is harder, which is why I said if Super White isn't as hardy as granite, then how can it be called quartzite?? that was my point. 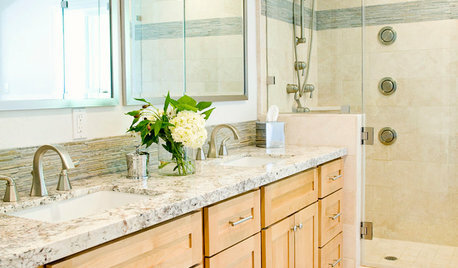 Super White is not a Quartzite. Sometimes it can be like quartzite,,based on the amount of crystals, but for the most part it's composed of dolomite,,, (did you know a knife blade or glass will not scratch quartzite? (or granite) Nina, you're prob not a geologist, but since you're in the business, you really should read up on geology and what constitutes what,,,the diff between calcite, dolomite, quartzite, what quartzite is composed of, what Igneous, Sedimentary and Metamorphic types mean and which stones fall under which type, etc. It's just good to know if you're selling the stuff. I know you wouldn't purposely try to sell something under another name, not if you were completely informed.